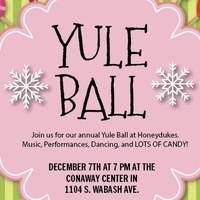 Dust off your good dress robes because it's once again time for The Muggle Association of Columbia's annual Yule Ball. This year's theme is Honeydukes, so there will definitely be LOTS OF CANDY! Dress in your winter's best, grab your broomsticks, and fly over to the Conaway Center in the 1104 S. Wabash building for a magical night of dancing, food, friends, and fun. Free for all Columbia students; any non-Columbia students will have an entry fee of $5.